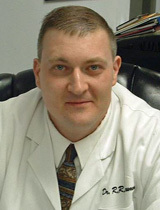 A graduate from National Chiropractic College in 1998, he joined Dr. Thompson in 2000 as an Associate Doctor at the Ironton Chiropractic clinic. He most recently received his Diplomat of Acupuncture certified by the Ohio State Chiropractic Board and has been treating the Ironton patients with wonderful results ever since. Dr. Krumm has an excellent record as a Doctor of Chiropractic in the community of Ironton, where he grew up and then returned. He is highly motivated to making a difference in the people of his hometown. As chiropractors we pride ourselves in our drug free, non-surgical approach to healthcare and by focusing on the causes of the ailment (not the ailment itself) we are able to improve the lives of countless patients. Call Ironton Chiropractic today to make an appointment!